FN Herstal provides integrated airborne weapon systems with unprecedented and unequalled firing capabilities for multi-role helicopters and subsonic aircraft while maintaining simplicity of use and crew safety. Taking advantage of its century-long firearms expertise, FN Herstal designs, develops and manufactures fully integrated airborne weapon systems equipped with combat proven, single-barrel automatic machine guns that offer reliability, accuracy, simplicity and safety. FN Herstal’s integrated airborne weapon systems include crew-served or axially mounted machine guns, rocket launchers and a complete range of ammunition. More than just selling weapon systems, FN Herstal develops the complete integration of the system together with the helicopter manufacturer or directly with the end user. The company supervises the installation of all its products and provides operator training as well as a high-quality after-sales service to meet our customers’ requirements. For 120 years, FN Herstal has successfully equipped generations of soldiers, airmen and marines. Its solid reputation can be attributed to its rigorous professional ethics, ongoing effort to achieve foremost quality, and commitment to efficient service and outstanding customer support. Every weapon FN Herstal builds proudly bears the FN Herstal oval, a mark that represents more than a century of experience making the finest weapons in the world. 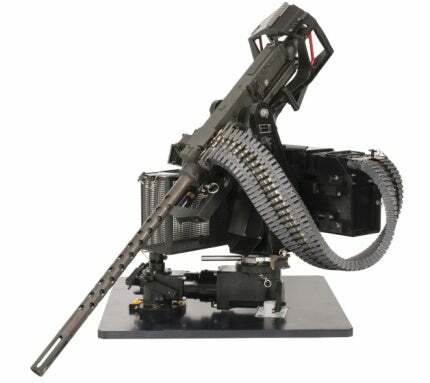 FN Herstal’s airborne pintle mounted weapon systems are fully mechanical and do not require any electrical power, making firing possible even if the carrier faces problems. They can integrate two different weapons, either a .50 cal or 7.62 cal FN machine gun. difficult operational conditions, such as sandy or dusty environment. An optional configuration is available with three additional rockets providing extra firepower. FN airborne podded mounted systems feature a fit and plug concept through 14in Nato standard lugs, for easy and quick adjustment of the helicopter configuration depending on the mission. To date, FN Herstal airborne weapon systems have been selected to equip more than 2,800 helicopters and subsonic aircraft worldwide. FN Herstal is also a market leader in the supply of small arms. FN Herstal manufactures and provides a full range of small caliber ammunition, including the .50 cal APEI (stands for Armour-Piercing Explosive Incendiary). FN Herstal has confirmed its attendance at this year's Enforce Tac exhibition being held in Nuremberg, Germany on 6-7 March 2019. For more than a century, FN Herstal has designed and manufactured small calibre weapons and ammunition adopted by a large number of countries worldwide. AT-6 Wolverine is a new light-attack aircraft designed and manufactured by Beechcraft, a subsidiary of Textron Aviation. Piper PA-34 Seneca V is a twin-engine light aircraft designed and manufactured by Piper Aircraft. Beechcraft’s (formerly Hawker Beechcraft) T-6C Texan II next-generation military flight trainer aircraft is an improved version of the T-6B Texan II primary aircraft training system. Bronco II light attack aircraft is being developed by Bronco Combat Systems, a US-based entity founded by Paramount Group, Fulcrum Concepts, and ADC. Hero-400EC (Electric, Cruciform) is an extended-range variant of the Hero family of loitering weapon systems developed by UVision Air, an unmanned air system developer based in Israel. The Strsljen multimission unmanned helicopter, developed by Serbian arms manufacturer EDePro, was unveiled during the International Defence Exhibition and Conference 2017 in Abu Dhabi, UAE. SmartGlider Light is a compact member of SmartGlider family of new-generation standoff air-launched guided weapons manufactured by French missile systems manufacturer MBDA. The Tejas single-seat, single-engine, lightweight, high-agility supersonic fighter aircraft has entered service with the Indian Air Force (IAF) in July 2016. JSC Russian Нelicopters unveiled Mi-171SH-HV military transport helicopter at the MAKS-2017 International Aviation and Space Show held in Moscow, Russia, in July 2017. Italian aerospace and defence company Leonardo introduced M-346FA (Fighter Attack) aircraft, a new variant of the Aermacchi M-346 twin-engine advanced trainer aircraft, in June. The Z-19E light attack helicopter, an export variant of Z-19 Harbin armed and reconnaissance helicopter, performed its maiden flight in May. Hurkus-C is a next-generation armed variant of the Hurkus basic trainer aircraft, designed and developed by Turkish Aerospace Industries. The first prototype of the Hurkus-C was unveiled in February. SPEAR is a high-precision, air-to-surface missile designed and being developed by UK-based missile systems manufacturer MBDA, to help meet the future combat mission needs of the Royal Air Force and the Fleet Air Arm. S-8OFP (С-8ОФП) is an 80mm unguided rocket developed primarily for the Armed Forces of the Russian Federation. Derby (Alto) is a beyond visual range (BVR) air-to-air missile (AAM) developed by Israeli defence company Rafael Advanced Defense Systems to meet the combat needs of the armed forces. The Philippine Air Force commissioned the first two of eight armed AW109 Power light, twin-engine helicopters in August 2015. The Tu-160 supersonic strategic bomber (NATO reporting name of Blackjack) was manufactured by the Tupolev aircraft research and engineering complex joint stock company of Moscow and the Kazan-Gorbunov Aircraft Production Association in Tatarstan from 1980 to 1992. The CH-47D Chinook helicopter carries out transportation of troops, artillery, supplies and equipment to the battlefield. The A-10 Thunderbolt is also known as the Warthog, the 'flying gun' and the Tankbuster. The aircraft was used extensively during Operation Desert Storm, in support of Nato operations in response to the Kosovo crisis, in Operation Enduring Freedom in Afghanistan and in Operation Iraqi Freedom. The S-70A helicopter is the export version of the multi-mission Black Hawk developed by Sikorsky. FN Herstal has announced that it will be attending this year’s International Military Helicopter event, taking place in London, UK. FN Herstal and its subsidiaries FN America and FNH UK will be attending this year’s Shot Show event in Las Vegas, Nevada, US. FN Herstal and its subsidiaries FN America and FNH UK will be attending this year’s International Armoured Vehicles event in London, UK. Belgium-based weapon and weapon system designer and manufacturer FN Herstal has issued the list of trade shows the company and its subsidiaries of FN America and FNH UK will attend in 2019. Leading firearms manufacturers FN HERSTAL has developed a new comprehensive FN® Airborne Digital Suite to meet challenging market demands and expectations on integrating machine guns into modern platforms, which will be exhibited at this year's Farnborough International Airshow. Following a successful partnership in displaying the deFNder® Medium Remote Weapon Station (RWS) fitted onto the THeMIS Unmanned Ground Vehicle (UGV) at the DSEI exhibition in London last year, FN HERSTAL and Milrem Robotics will go a step further at EUROSATORY in mid June. FN Herstal will display its deFNder® Medium Remote Weapon Station (RWS) along with the ANTARES optronic system at this year's international defence and security EUROSATORY exhibition, to be held in Paris, France, from 11-15 June. FN HERSTAL, along with its US subsidiary FN America, will be taking part in this year's Special Operations Forces Industry Conference (SOFIC) between 21-24 May in Tampa, Florida, US. FN HERSTAL and its US subsidiary FN America will be participating in the upcoming ITEC conference between 15-17 May in Stuttgart, Germany. FN HERSTAL, along with its US subsidiary FN America, will be taking part in the International Defence Exhibition Bratislava (IDEB) 2018 between 16-18 May at the EXPO-Arena in Bratislava, Slovakia. FN Herstal, along with US subsidiary FN America, will be attending the QUAD-A 2018 Army Aviation Mission Solutions Summit. FN HERSTAL and US subsidiary FN America will be attending the 20th anniversary of FIDAE, a leading aerospace and defence trade show in Latin America. FN Herstal, along with its US subsidiary FN America, will be attending this year's EVTA in Paris, France, on 29 March. FN Herstal has proposed a short telescopic buttstock for its FN SCAR®-SC Subcompact Carbine. FN Herstal and US subsidiary FN America will be attending this year's Enforce Tac international exhibition and conference. FN Herstal is pleased to announce that its FN® FCU Mk3 Fire Control Unit has been selected to be part of the Infanterist der Zukunft - Erweitertes System (IdZ-ES) program for the German Army. FN Herstal and subsidiaries FN America and FNH UK will be attending this year's International Military Helicopter (IMH) show between 30 January - 1 February. FN Herstal and its subsidiaries, FN America and FNH UK, are pleased to be attending this year's SHOT Show between 23-26 January. FN Herstal, along with its subsidiaries FN America and FNH UK, will be attending this year's International Armoured Vehicles (IAV) Conference. Small arms company FN HERSTAL will be attending Expodefensa taking place in Bogota, Colombia, between 4-6 December. At Milipol Paris 2017 FN Herstal, the world’s leading designer and manufacturer of small arms, will unveil an innovative addition to its renowned FN SCAR® family: the FN SCAR®-SC subcompact carbine. FN HERSTAL is due to appear at the MILIPOL 2017 event, which is in Paris, France, from 21-24 November. FN Herstal, along with its US subsidiary FN America, will be attending this year's Defense & Security Expo in Bangkok, Thailand. Three years after being acquired by small arms manufacturer FN Herstal, Manroy Engineering has revealed its rebranding and name change to FNH UK. Small arms manufacturer FN Herstal, along with its subsidiary FN America, will be exhibiting at SITDEF 2017 in Lima, Peru, between 18-21 May. FN Herstal, along with its US subsidiary FN America, will be attending the Special Operations Forces Industry Conference (SOFIC) 2017 in Tampa, Florida, US, between 15-18 May. FN Herstal and its subsidiary FN America will be exhibiting at this year's EUROPOLTECH, between 26-28 April. FN Herstal, along with its US subsidiary FN America, will be exhibiting at this year's QUAD-A show. Leading firearms manufacturer Belgium-based FN Herstal is introducing its third-generation Mk3 version of the FN® FCU. Belgium-based leading firearms manufacturer FN Herstal will be exhibiting its FN® Expert Marksmanship Training System at this year's IDEX trade show in Abu Dhabi between 19-23 February. Leading firearms manufacturer FN Herstal has released its newly developed, self-powered for the FN SCAR® collection of rifles based on breakthrough technology. FN Herstal will be visiting the NATO Life Cycle Management (LCM) Conference between 24-25 January at the Parker Hotel Brussels Airport, Belgium. Small arms specialist FN Herstal, along with its subsidary FN America, will be attending the SHOT Show 2017. FN Herstal has issued the list of trade shows the company, and its US subsidiary FN America, will attend in 2017. Belgium-based FN Herstal, a leading firearms manufacturers, will be exhibiting its full portfolio at this year's Defense and Security Equipment International (DSEi) exhibition on 15-18 September in London, UK. FN Herstal will be exhibiting at the LAAD Defense and Security Exhibition 2015. FN Herstal, a world leader of small caliber weapon systems, has teamed with Dillon Aero to add to its portfolio of FN MAG® 58M and FN M3M™ (GAU-21) machine guns, the Dillon Aero M134D Gatling gun, as an additional option to its airborne pintle mounted systems. FN Herstal will attend the Enforce Tac exhibition, which will take place from 5 - 6 March 2014 in Nuremburg, Germany. It all started back in 1889 with a talented team of entrepreneurs. Today, the Herstal Group people still share the same culture of innovation, quality and customer excellence as from the very start. Belgium-based small arms manufacturer FN Herstal unveils the next generation FN MINIMI® light machine gun in both 5.56mm and 7.62mm calibers during the MILIPOL exhibition in Paris (19 - 22 November 2013). FN Herstal will attend the MAKS International Aviation and Space Trade Show, which will take place in Zhukosvky, Moscow Region, from 27 August to 1st September. For the first time in its history, Belgium-based FN Herstal has utilised advanced composite material for yoke manufacturing. Two armored vehicle manufacturers, Renault Trucks Defense and Streit, have selected the deFNder® remote weapon station to equip their vehicles at the international IDEX 2013 trade show, to be held in Abu Dhabi from 17 to 21 February 2013. FN Herstal has recently been certified to AS/EN 9100 aerospace standards, the most advanced quality management system (QMS) standards for aviation, space and defence industries.